As I’ve been stumblingly re-learning old skills and learning new ones, guzzling down new information and finally practicing ideas I’d only understood abstractly, I realized something. I didn’t think of myself as a spinner. I felt like a poser – I had the stuff, but not the love. It’s been so long since I’ve made time for spinning that I’d taken it for granted that I couldn’t make time for spinning. The truth is, it’s been a long time since I loved it, since I really connected with it, though I’m sure I must have at some point. I’ve seriously considered selling my wheels and stash, just because unused useful things are oppressive to me. But now, as I’ve started making yarn again, I’ve suddenly had so much joy in it – in the learning process, in all the variation in a series of tiny projects, in the experimentation and trial and error. Along the way, I’ve come to accept that I am a spinner. I have been a spinner. Actually, I’ve made some pretty lovely yarns over the years. I was critical of them because they weren’t always what I expected, and they didn’t always do what I wanted them to. But they were dang fine yarns. I didn’t know what I was doing, but I did it pretty well! I go through pretty intense phases with things sometimes. I make spreadsheets. I make plans. They’re often about escapism: am I really going to celebrate all the holy days in the church with the kids? no. Do I really want to write a cooking blog? no. Am I ever going to live on a farm? no. Am I really going to read the entire works of C.S. Lewis? Being a third of the way through his first volume of letters, I can say no. Usually, I burn myself out after a few weeks, figure out what I’m avoiding and deal with it, and if I’m lucky I haven’t bought anything. But this…. this is different. Yes, it’s definitely subconscious – I have a big work thing that is awesome but intense and it takes something intense to keep me from being stuck on it, and this is serving that purpose. But I don’t want to burn out on this. There’s no pretense here: I am a spinner. I own three wheels. I have enough stash to keep me spinning for three years. I don’t have to buy anything. This is an avocation that is allowed. With that in mind, I’m going to embrace the melding of intention and creativity, and set some goals for this year. Not rules, not grand plans – just guidelines for how I want to spin this next year. DO spin during any free alone time – don’t feel like you’re not allowed to spin just because you have other crafts on the go. DO spin only one project at a time. I think if this is going to be sustainable, I am going to have to seriously resist getting bogged down in any long projects or grand plans. I love making plans, but unlike with knitting, if I lose the love on a spinning project, I’m stalled. It’s much harder for me to power through a spinning project gone wrong than a knitting one. Still, I do have a ball winder. If I need a break and to start something else, it’s possible, and I should give myself permission to do that if I really need to. But for this first year back, I want to avoid that kind of situation. It’s happened to me so many times! Received some wonderful wool-related mail in the last 24 hours! That is all a very long way of saying, I am owning this. I can absolutely make time to spin, if that’s what I want. Maybe because I’ve finally gotten my knitting WIPs reliably under control, I feel like I can have spinning WIPs that actually go somewhere. I just get to choose whether to spend my free time spinning or knitting. (Or sewing or writing.) 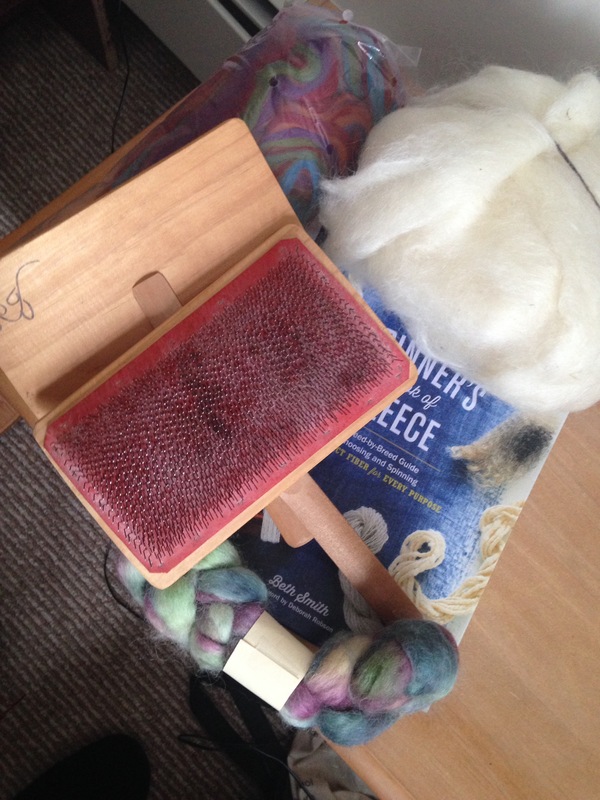 Realizing this – and realizing the whole world of learning about spinning that is open to me if I apply myself – gives me a lot of joy and excitement about spinning as a creative outlet. But I’m getting ahead of myself. I’ve only spun 13 oz. One sample at a time, one lesson at a time. And seriously. NO more stashing! Unless I see that qiviut at Malikaat again. That’s different.